Home/Site News, Store News, Vaporizers/New Da Vinci Vaporizers – Available Now!!! The DaVinci Vaporizer has a flexible mouthpiece that is also threaded for easy removal. This is a huge advantage because if it is found that the mouthpiece is holding the DaVinci Vaporizer back from truly being pocket size, it can be can unscrewed quickly and easily. On the front of the DaVinci Vaporizer there is a small LED read out that displays the current temperature at all times. In addition, there is also a battery indicator to inform how much charge is left, which makes using the DaVinci Vaporizer more convenient. The three lithium-ion batteries inside the DaVinci Vaporizer combine to give 45 minutes of continuous vaporization time, uninterrupted. When it comes time for a charge simply plug the unit into the included wall charger. The DaVinci Vaporizer can also be used while plugged in, even on a completely dead battery. That is one feature that not a lot of portable vaporizers can compete with. As a safety feature, the DaVinci Vaporizer uses two different power buttons. First switch the unit on by turning on the power switch to the right. Then for the vaporizer to begin to heat up, hit the power button on the face of the vape. This ensures that the DaVinci Vaporizer never accidentally fires up either in your bag or pocket. The two oil cans included with the DaVinci Vaporizer are one of the most convenient ways to vaporize essential oils on the go. These small cans load right into the upper screen of the herb chamber and can even be pre-loaded ahead of time. This feature alone makes this vape more versatile than most of the competition out there. When the cap to the DaVinci Vaporizer’s herb chamber is opened there is a small rubber cap that when removed, reveals a storage area that can be used to hold up to three times the amount needed for one pack in the chamber. Right above that there is a small cleaning brush that is perfect for cleaning out the DaVinci Vaporizer’s herb chamber, and getting any last used material off the screens. With the storage and the brush you have everything you need for multiple vaporizing sessions at your fingertips. 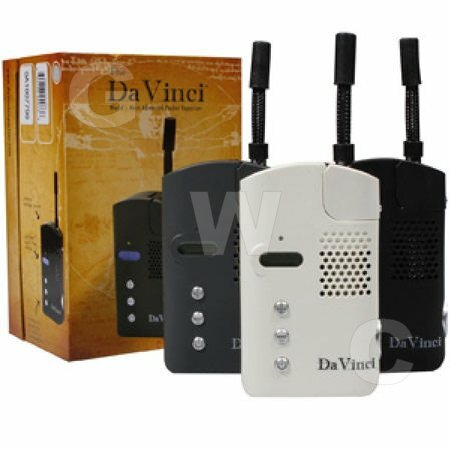 If you are looking for a vaporizer that is unassuming, then the DaVinci Vaporizer is a great option. It almost looks like a small walkie-talkie, rather than a portable vaporizer. The only markings of any kind on it is the “DaVinci” logo in the lower right corner, but it has no mention of the word vaporizer. Please note: this product is sold for legal tobacco use only. Under no circumstances should any item be used for any other reason including any illegal use. When you purchase any item from us you are agreeing to this and release Giggles.com from any and all claim(s) of misuse whatsoever. Enjoy your purchase! Purchase yours now or shop our tobacco shop online for more great products!